My life as a young girl growing up on a small Minnesota dairy farm could have been a hard, even dull life, had it not been for my mother. My father’s thick gnarled hands were a reflection of the work that was required to manage a dairy farm and provide for a large family. It was from him that I learned the art of “can-do-ness”. I.e., the art of improvising. We were poor but never do I recall us being without. My mother added color to our life. Fun surprises that broke up the routine of chores. Her love of life was infectious as she decorated for holidays, baked birthday cakes, encouraged not just me but everyone to play a musical instrument and to read. My mother was a graduate of the University of Minnesota and loved reading. She took us to see plays and concerts. She encouraged her tribe to try different foods and to explore. She gave me a sense of the horizon and the curiosity to look beyond its limitations. She was the kind of mother who upon laying eyes on her eight-year-old daughter (me) who was standing on the bare-back of our old horse, Chee Chee, and galloping down the gravel driveway — did not scream, but silently smiled and went about her business. When ever I recall this incident to memory I shake my head, “How could she have let me do that, and watch”!!! She gave me the space to be as wildly adventurous as I needed to be. Her philosophy of life had been passed down to her by her mother and her four aunts. Capable, daring women who sought to change the world through education, the arts, science and…. adventure, this my Mother passed down to me. 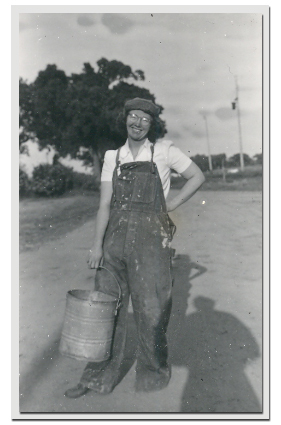 My father milked a small herd of Holstein cows–tall, lanky cows burdened with pink udders, heavy with milk until twice each day, they were brought into the barn where their precious cargo was delivered into stainless steel milk cans. What a playground. Everyday is an adventure on a small family farm. Both my father and mother rode horses, and I suppose I rode with my mother even before I entered this world. I had two older sisters, old enough to carry me outside and set me on top of old Spot’s back, a crippled black and white Welsh pony that was more or less a lawn ornament and baby sitter for dozens of children. My affection for horses came as natural as laughing. It’s not hard to see how and why the strong love of horses still resides in me. I WAS a horse for my first twelve years. By the time I was four years old I could ride alone and what greater scene could be set than that of a dairy farm for a fearless young girl and her horse. Small farms are much like small towns, a variety of activities, a lot of coming and going with tractors, wagons, big machinery. Unique communities (the cow herd, the horse herd, the cat community, the flocks of birds) all engaged in and around a set of buildings that had different functions all contributing to “the town of …Ende’s.” With five siblings and many cousins, friends or neighbors stopping in, my memory of the old farm house and life was that of a grand central station. Activity overflowed down the wooden front porch. Once chores were done I was more or less free to ride, alone, over hundreds of acres on our family farm near Rogers, Minnesota. I would escape to the dirty brown Crow River with my horse, or bring the cows in on my horse, or race between rows of 8-foot-tall corn stalks, the ripe corn beating against my bare legs. I’m sure my father must have seen the hoof tracks, but he never said anything. 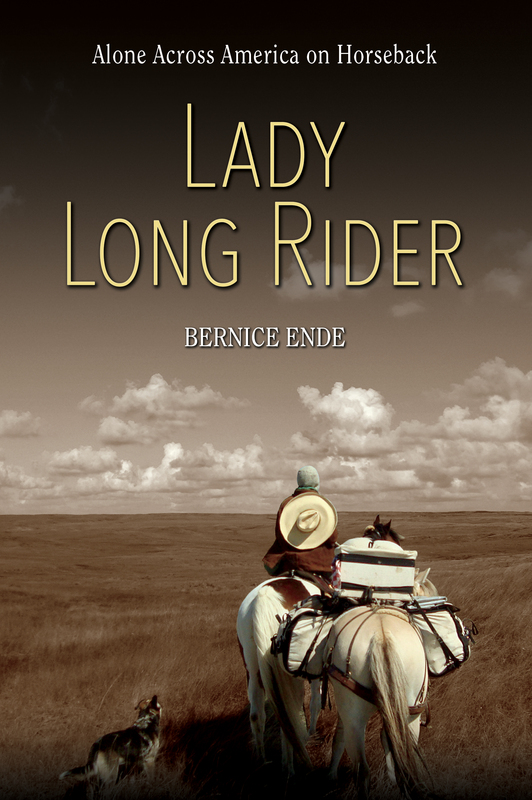 I lived on the back of a horse for the entire first sixteen years of my life–well, nearly. The tail end of the “golden age of cowboys,” Roy Rogers, Hop-a-Long Cassidy, The Lone Ranger, black-and-white figures which held me in trance until I raced out to do my own riding. Across the cow pasture I’d ride, scattering the young steers–imaging it the great wild west itself. I have often thought I am doing the exact same thing I did as a child. I remember thinking on my first ride, after leaving the Irwin Ranch north of Green River, Wyoming, that I’d ridden this before. The red cliffs of Wyoming, the Red Desert of Colorado, sagebrush, and rattlesnakes were all pouring from my childhood memories of black-and-white TV shows which had captivated me. I’d done hundreds of long rides as a small girl. My imagination carried me effortlessly over a small Minnesota dairy farm as if it were the entire world. So you see, I began long riding at a very early age. But one might ask, “How does a Minnesota farm girl get to… ballet teacher?” The horse, that is how–inspired by the horse, a most gifted dancer. I studied under Ms. Susan Higgens, Portland, Oregon, Royal Academy of Dance method. I taught in San Francisco and Minneapolis, then picked up a Fitness Specialist degree at Lake Washington Voc-Tech, in Bellevue, Washington. I taught for 25 years–Corporate Dance/Fitness and Classical Ballet. In 1992 I moved east from Seattle, Washington to Trego, Montana. I opened The Community Dance Studio in Trego and the Whitefish School of Classical Ballet in Whitefish, Montana. I have called northwest Montana home ever since. Ten wonderful years working with local children. Teaching an unorthodox ballet class in an old community hall building next to the Trego Firehall. The wooden structure at that time had an outhouse and wood heat. It took at least five hours to heat the building for classes. I made wood ballet barres and many times the girls would be warming up in gloves or mittens at the ballet barres pulled in close to a black, double-barrel wood stove. Each summer I gave horseback riding lessons at my mountain cabin and trained a few horses for the McCurry Ranch. Retirement in 2003 brought not a lack of activity, but rather a change of focus. I felt the pull of the open road. Adventure called, the need to go, see, do. A window of opportunity opened and I climbed out. Snow remained late into March at my mountain cabin. I was riding along, a brilliant sunny afternoon, minding my own business when I saw them. Two tiny puppies off to my left, not far from the snow-packed road. They had evidently been abandoned. One was dead, the other shivering and growling in protest when I slid off my old mare, Babe, and reached for the filthy creature. I took her home of course, and thus began Claire Dog’s extraordinary horseback riding skills. The puppy had not been in the cabin two hours when my old dog Sadie got hold of her ear and tore it… thus the one ear up, one ear down. I tried in earnest to find the puppy to a good home. I already had two dogs. No one at my two dance studios would take her (sensible parents). The children gave her the name Clara from our “Not Quite the Nutcracker” performance we preformed each year. I changed Clara to Claire Dog. She was a terror, devouring shoes, boots, and other personal articles she managed to steal as puppies will do. Her wild, mismatched appearance combined with her Blue Heeler coloring seemed to enhance her unruly personality. She was five years old when she did her first ride, she walked the entire 2000 miles. She also walked the second ride, a 5000-mile trek. “Enough already,” she complained. She needed a horse of her own and a comfortable doggie box to ride in. Any of you who saw her riding knew she truly was “the star of the show.” A true Montana original, a rare breed of unknown origin. My fearless leader, my faithful companion, Claire Dog after 17,000 miles, made her last long ride in 2012. She passed away at the age of 16 in 2015. Essie Pearl my beautiful girl, is a 14-year-old Norwegian Fjord, raised from a foal by Theodora Brennan of Eureka, Montana. 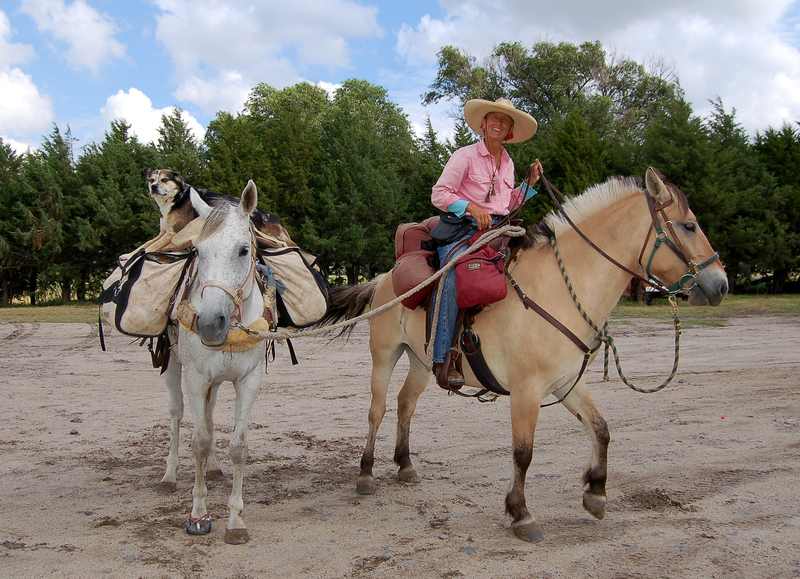 I purchased Essie Pearl (a fat, cantankerous “pasture-potato” horse back then) for the 3000-mile 2008 ride. The fact was, Claire needed a trust worthy steed to ride. Essie Pearl makes up in personality what she lacks in refinement. She retains an ancient look from a breed that has remained pure for thousands of years. 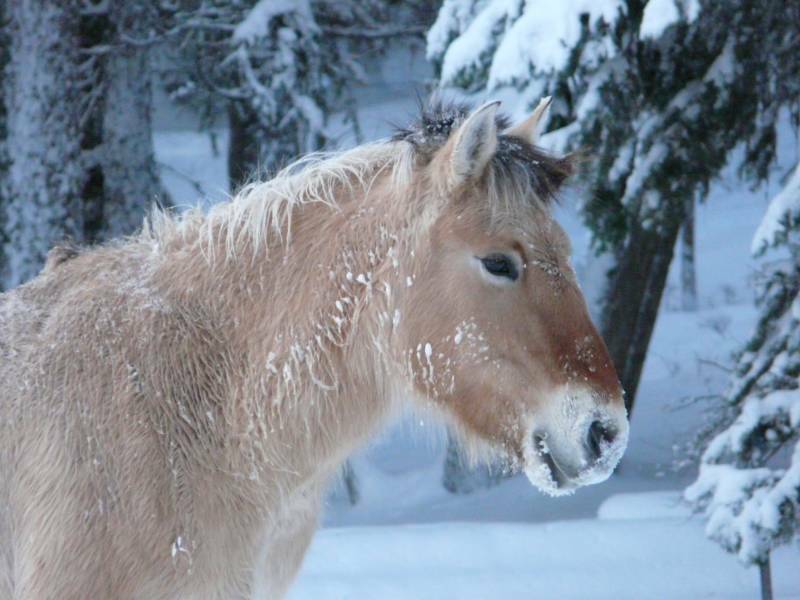 The Fjord horse is one of the world’s oldest breeds. It is believed that the ancestors of the modern Fjord horse migrated to Norway or, as another story goes, the Vikings brought Mongolian ponies back from their worldly exploits, feeding the hearty ponies seaweed to keep them alive on the returning boat journey. However they got to Norway, we do know they were domesticated over 4000 years ago and archaeological excavations at Viking burial sites indicate that the Fjord horse has been selectively bred for at least 2000 years. (Wikipedia) Her sturdy, dependable disposition and structure make her a vital part of our team. 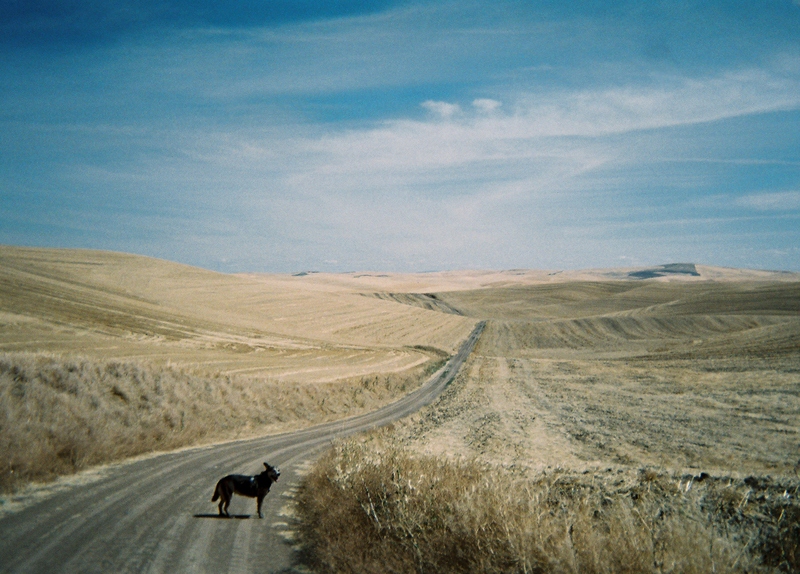 She has traveled with me for over 21,000 miles–a tenacious, willing, steadfast horse. A good long riding horse must have, in my opinion, a thick skin, heavy coarse hair, long hairs on their legs (feathers) and be an “easy keeper”. They should have big feet, not too tall, a broad short back, short neck, deep wide chest. Add a nice soft jog, AND a disposition as steadfast as a train, and you’ll have a great long riding horse. Over the years I traveled with a Tennessee Walking Horse, a Thoroughbred, and a Quarter/Thoroughbred horse and they did well, but not nearly as well as this sturdy Draft Pony breed, the Norwegian Fjord. Essie is curious, gentle, very jealous of other horses, and had been, until Montana Spirit joined the tribe, been the alpha mare. Essie is my right hand girl. The relationship that comes when living with a horse in these uncertain long-riding conditions is a humbling relationship. Needless to say, the horses mean a great deal to me. I lost Essie Pearl in 2016. It was a devastating blow. She died from EPM a parasite that effects the brain. It’s transmitted by varmints and likely picked up on my east coast ride. 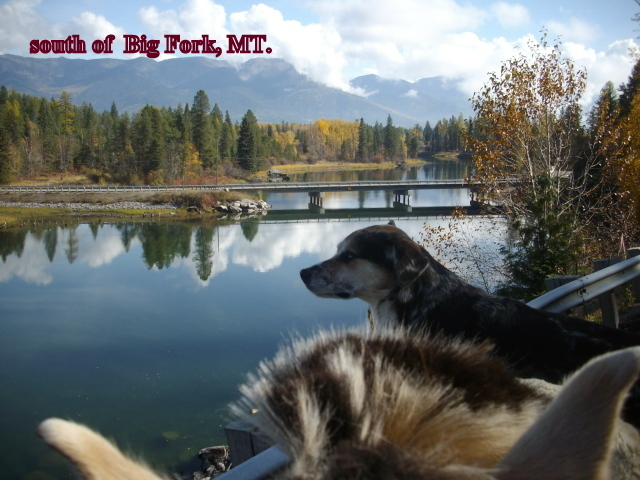 Montana Spirit joined our group of travelers in 2012. She is an eight-year-old Norwegian Fjord and Percheron cross, and is owned by Swede Granstrom and Doti Smith from the Montana Mountain Ranch of Rosebud, Montana (see sponsorship page). She is developing into a lead mare with over 10,000 miles of experience. She may be the finest of long-riding horses that I will ever travel with. The Percheron is a draft horse, the Norwegian Fjord a draft pony, similar in that they both have big bones and were bred for working, not speed. She is bigger, fuller than Essie. She is no longer a youngster and has taken over the alpha mare position, she’s a natural leader. It’s sometimes hard to tell the two mares apart. My big Hart, biggest heart I know (he came from the Heart of Texas, thus his name Hart). This is Hart and Claire in 2013, comfortably retired. Hart was given to me by the Odi Wright family of Menard, Texas when I lost my beloved mare Honor in a tragic corral accident. That was back in 2009 and I was mid-way thru a 6000-mile ride. Hart finished that ride, then completed another 2000-mile ride, the Canadian ride, traveling with Claire, Essie and I for nearly 6500 miles. He retired in 2014 at the age of 18. He was steadfast and led us bravely through thick and thin. Hart passed away at the age of 20 in 2015. Honor, what a horse she was, a throw away, headed for the cannery, just plain crazy. I could see why she had been rejected time and again. But the long ride came to suit her–it gave her a spread of highway to spill that never ending energy upon. She came from the famous Native Dancer line of Thoroughbred race horses. 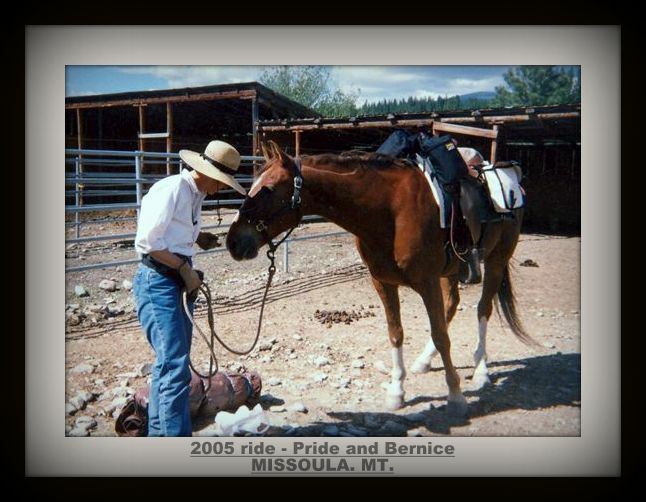 Honor carried me on the single-horse 5000-mile ride, and the 3000-mile ride in 2008 with Essie. Half way through the 6000-mile ride in the winter of 2009 destiny threw us a fatal blow. I’d stopped to see my sister Carol in Wimberley, Texas. While visiting my sister in town, Honor broke her leg in a freak corral accident. It nearly ended my long riding career. Hard one, losing her. Pride is a tall, dark sorrel Tennessee Walking Horse that belonged to Mac and Evelyn McCurry who owned the McCurry Ranch in Trego, Montana. He was 12 when he carried me on my first ride, a 2000-mile single-horse journey. How he ever survived my inexperience and just plain stupidity, I will never know. Tough horse. I rode into a nightmare, knowing so very little about long riding. He endured many of my mistakes. Pride is now 23, retired, and lives a great life among a herd of horses that our local veterinarian and good friend Nancy Haugan and her husband own west of Eureka, Montana.